A vertical boulder stands as a dramatic focal point for this fire pit and sitting area. While love comes in many forms, a nearly 4,000 pound rock isn't what usually comes to mind. But like a new pair of shoes or perfect fall sweater, our customer had to have it. In fact, it was the impetus for a project that wasn't even on her home improvement radar when it was purchased. The 9' tall, purple-brown beauty, sat for 2 years waiting for design ideas to take form. When European Stone Masonry LLC arrived on the project, it was standing upright like a lonely Easter Island figure. 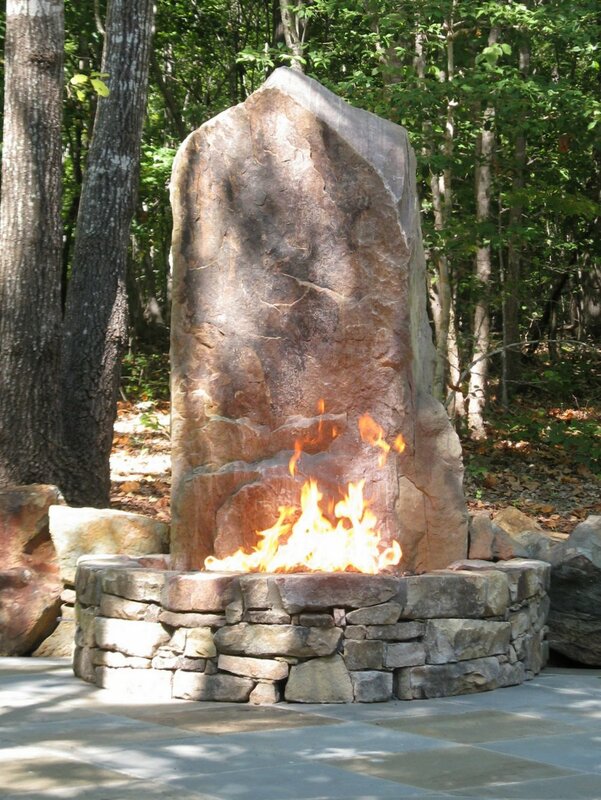 A landscape designer suggested using the rock as a vertical feature for a fire pit and flagstone sitting area. However, it wasn't yet stable enough to construct the sitting area around it. So, that's when we went to work. We started by bracing it temporarily with 4" x 4"s from both directions. The humble rock - now elevated to an elegant stone - was stabilized with a steel framework from behind. Concrete was poured over the steel to anchor the framework in place. 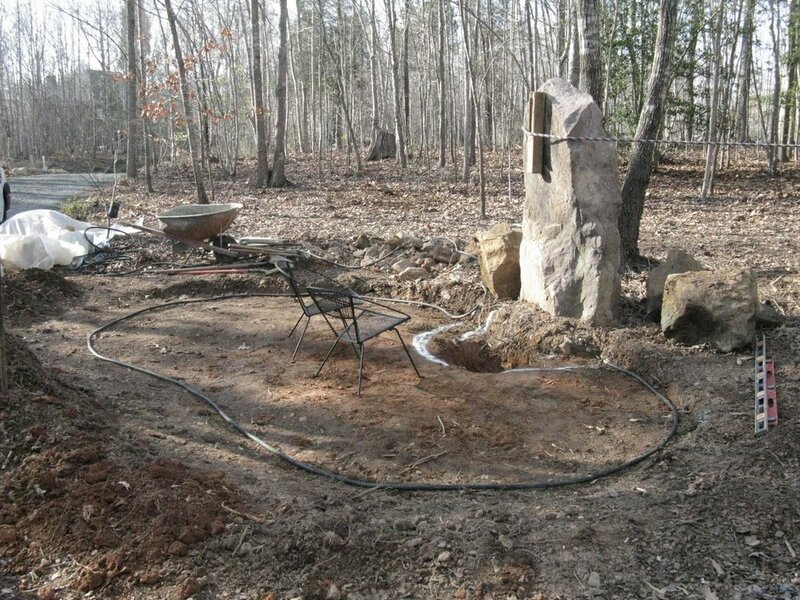 Next, a hole for the fire pit was dug in front of the stone. Concrete was further added to the front edge of the stone, stabilizing it from all directions. "Boulders and building stone combine for an inviting aesthetic that is both man-made and nature made." With the stone now securely in the ground, we could work safely pouring concrete for the steel-reinforced sitting area. Native boulders were collected on the wooded Chatham County lot and used to flank the dry stack fire pit. Boulders and building stone combine for an inviting aesthetic that is both man-made and nature made. The sitting area was designed with rounded lines and balances the angular shape of the vertical stone. Variegated bluestone was chosen by the homeowners to coordinate with a walkway previously built by European Stone Masonry LLC. The bluestone was set in a diagonal grid pattern and finished with a 9" border for a polished look. Paths leading to the driveway and walkway nicely connect the sitting area to the rest of the property. Our customers had an aluminum pan custom-made to hold the blue glass beads from which a gas fire appears. 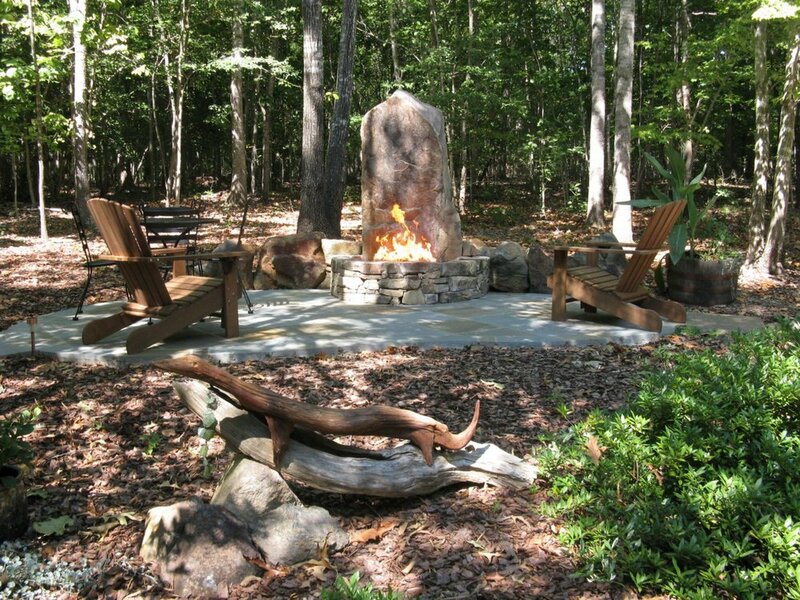 There's room for a small table and chairs plus "his and hers" seating in front of the fire pit. We hear it's a lovely spot to share a glass of wine on a brisk fall evening.